School has begun for a motley crew of teenage kids. This isn't just any school though, it's a school with one primary focus. To train kids in the field of spying. The usual academic courses would still apply, along with briefings about what actually goes on in the world. Weird super villains, government cover ups and even time travel. These young recruits would also be tutored in martial arts, weapons and anything that Will Smith would love to know within the Men In Black series. 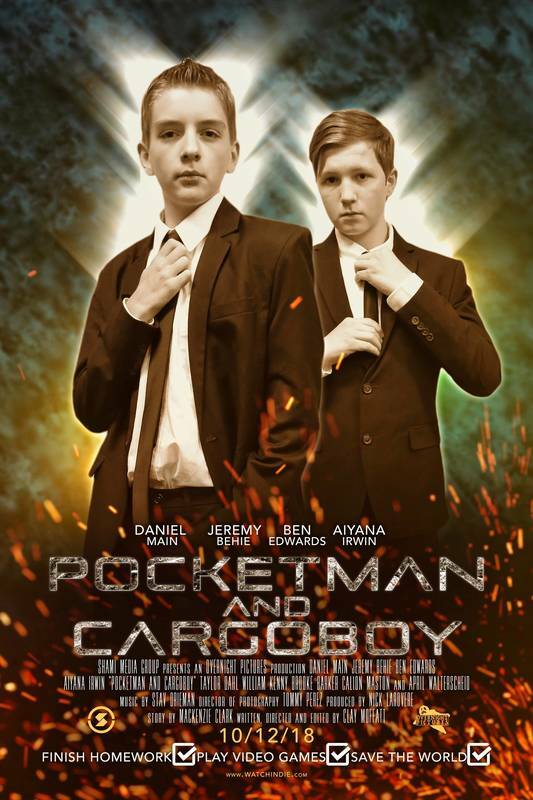 Pocketman and Cargoboy is a title with high hopes and an airy flow. A decent micro budget title that is both entertaining and a little silly. The majority of this title is about the schooling of Pocketman and Cargoboy. Nick names for the two main players in this film. The title is a mix up of cliche and genre expectations, including the zen martial arts master who diligently trains his pupils. The remaining adult teachers are assigned menial positions teaching math and literacy etc, etc. The agent in charge, "baseball cap man" aka agent Hill, teaches weapons and secrets along with his duties keeping the school running. It's all very deliberate and by the looks of things, everyone had a good time making the film. The problem is that having fun with a movie doesn't always mean a title will be problem free. Major plot holes reside in this title such as the climactic time travel event, that happens at the end of the film. Why wouldn't the evil Dr Fantom have been taken care of earlier? Using the time travel device by more seasoned agents? Technically you could get into the logistics of time travel. Crossing paths with your former self, yadda yadda yadda. That doesn't really make sense when another agent could just be sent; all before the final climax. The other thing I noticed was that Pocketman and Cargoboy didn't really know where it wanted to go, or what it wanted to be. There are 3 distinct plot lines. An opening villain sequence that seems like it means more than it actually does. The educational plot where the spy kids get trained and then finally, another plot designed to test the kids newfound education. I understand the third plot. It would be silly to have a film where spies get trained and nothing happens. But devoting so little time to that final showdown felt wrong. Even having a little more meat throughout the title, that eventually becomes the final showdown would have worked. In essence, Pocketman and Cargoboy is a Police Academy kind of film with a bad guy thrown in at the end for good measure. It could have all worked so much better had more foreshadowing been present. I think my biggest problem was the amount of bloat. That first segment that I'm sure was meant to serve as an introduction to the characters. The quick inclusion of agent Hill's boss that could have been completely skipped over and implied. Basically this was a title that wanted to have to many characters with not enough for them to do. I'm not saying this was a bad movie, as my rating reflects. I found some interesting plays on how and what we think of things. I even laughed a little and actually really liked how the time travel effect was accomplished. Pocketman and Cargoboy had a lot on it's plate to address and cover; and it did an admirable job delivering the goods. This may not have been the best title I've seen recently, but it is far, far from the worst.